It only takes a few minutes to learn these signs. Then take the opportunity to share them with your child whenever it’s relevant. See an Easter basket at the store? Point to it and sign Easter Basket! Did grandma give your child a chocolate treat? Point to the chocolate treat and sign Chocolate before you hand it over. Make signing a playful adventure. Ok, hop to it! Easter – (There are several ways to sign Easter – this is one of them!) To sign EASTER, make an E shape with your hand, then shake it back and forth, OR twist at your wrist. Bunny (rabbit) – To sign BUNNY, cross your hands in front of you at your wrists. Make BUNNY ears with your pointer and middle fingers and wiggle them up and down. Looks like floppy bunny ears as the bunny hops around. Easter Bunny – To sign EASTER BUNNY, sign EASTER (shown above – use one hand or two), then sign BUNNY (shown above). Basket – To sign BASKET, use both hands to make a C shape, then outline the bottom of a BASKET. Egg – To sign EGG, use both hands and make the H shape. Tap one set of fingers on top of the other, and then drop both hands downward. Just like you are cracking an EGG. 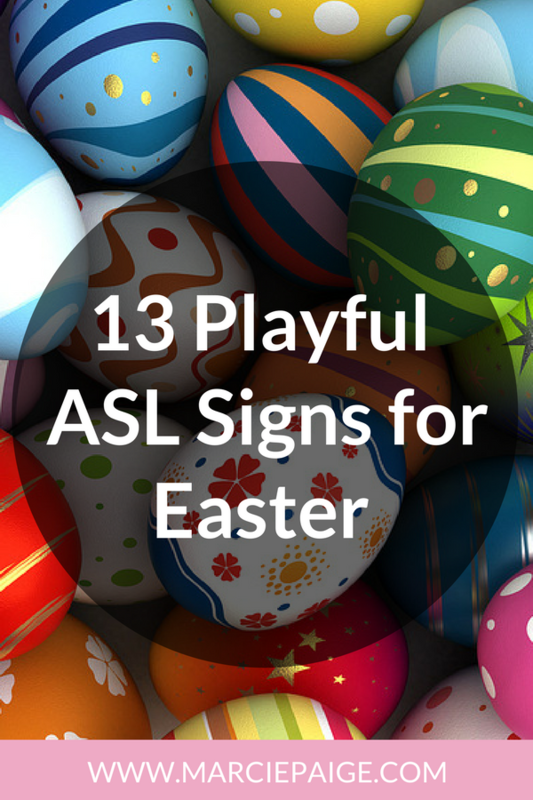 Find Easter Eggs – To sign FIND, place your dominant hand in front of you with your palm facing down. Then lift your hand upward and at the same time touch your thumb and pointer finger together. Just as if you are picking something up. Then sign EASTER (shown above), and EGGS (shown above). Chocolate – To sign CHOCOLATE, make a C shape with your dominate hand and move it in a circle on top of the back of your other hand. To remember this sign, think of stirring a pot of melting chocolate. Chocolate Bunny – To sign CHOCOLATE BUNNY, sign CHOCOLATE (shown above), then sign BUNNY (shown above). Chocolate Eggs – to sign CHOCOLATE EGGS, sign CHOCOLATE (shown above), then sign EGGS (shown above). Candy – To sign CANDY, point to the side of your chin, just above your jaw and twist your finger back-and-forth. Chicken – To sign CHICKEN, first sign BIRD. Take your thumb and index finger and make an open beak. Close the beak by pinching your thumb and index finger together, (I forgot to sign this next part in the video!) and bring your hand down to peck at the ground (represented by your other outstretched hand). 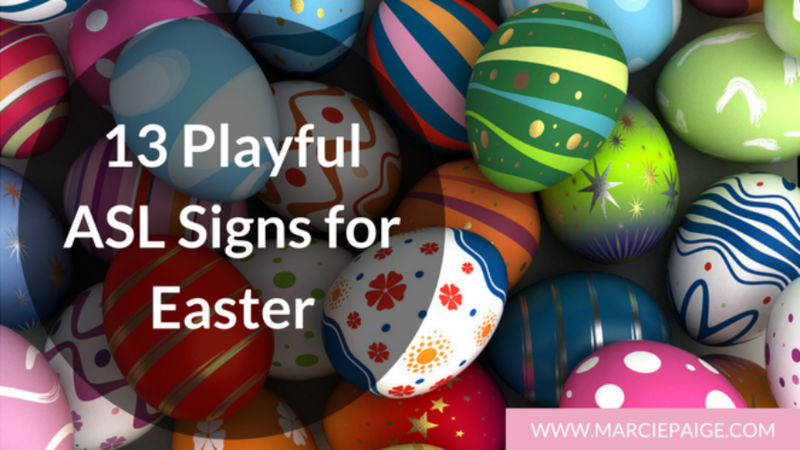 Happy Easter – To sign HAPPY EASTER, first sign HAPPY by patting your chest in an upward motion. Then sign EASTER, (shown above). Now if you’ll excuse me, I have some shopping to do! Because… #EasterIsComing. And… #MyGirlsNeedNewSpringDresses. And… #SaltedDarkChocolateMakesEverythingBetter. Speech vs Language – They are not the same thing. Watch the video! When to start signing with your baby — Or, is it too late? Find out here! How to teach a sign and make it stick. (It’s easier than you think!) Go here! Next: Speech vs Language – Not The Same Thing!